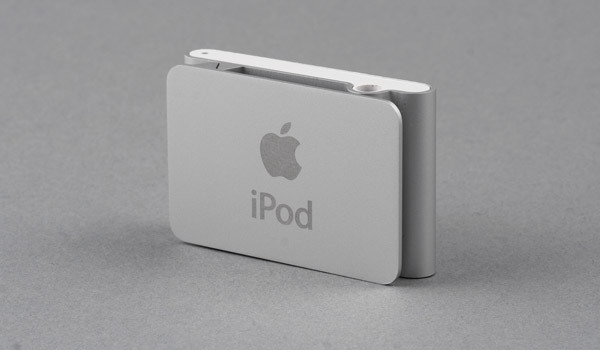 After the first models of iPod nano, iPod Shuffle did not look that attractive - it had similar dimensions and the lack of a display robbed the model of all iPod nano advantages. 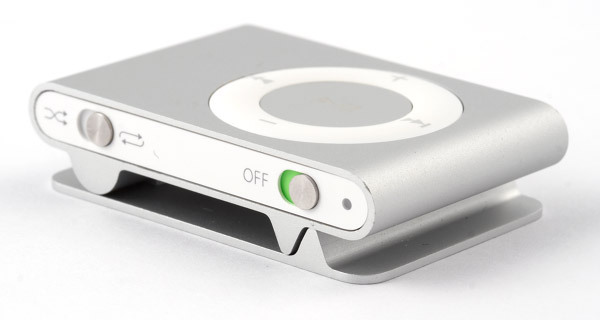 Apple must have either given up iPod Shuffle at all (that is update nothing and sell out what was left in store), or changed it completely - create new unique competitive advantages of Shuffle models not to lose a significant share of the market. Apple chose the second way, of course. One of the most vital questions that consumers ask about any portable device, be it PDA, mobile handset, or mp3 player, is how they can carry it. Accessory manufacturers know it well. They sensed the demand in time and formed a huge market of various holsters, retention modules, straps. Apple understood well that if it launched an mp3 player, which would require additional accessories, its dimensions, weight and cost would grow significantly (compared to the player itself). And the new product would lose serious competitive advantages. That's why the player is now equipped with a clip to wear the shuffle model practically everywhere on clothes. It's sturdy, holds well, we failed to see any drawbacks. So the player is now a complete product — you don't have to think about buying accessories anymore. 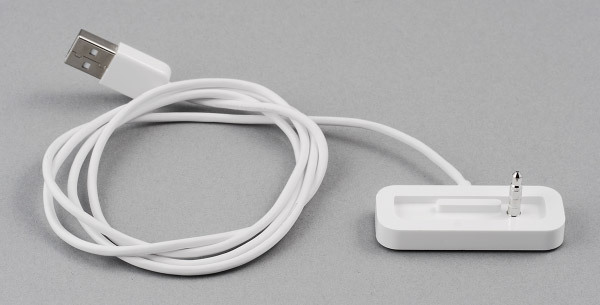 iPod shuffle uses a 3.5 mm mini jack for synchronization, it has no other connectors. You can use this player as a flash drive to carry files with you, but this feature will hardly interest many users — 1 GB is not always enough (you can already buy 16 GB flash drives, you can read about them in our news here and here). Besides, most users will most likely fill the player with music "to the brim". Add the dock station, which is required for this function, and there will be very few enthusiasts to use this feature (full-size iPod with an 80GB hard drive is another matter, you can even take a cable with you from time to time). Playback controls are identical to those in the first shuffle model: the main group (circle) consists of five buttons (volume control, back/forward, pause/play in the center). There is no Click Wheel, like in iPod and iPod nano. It would have been out of place here. There are two switches on the bottom of the player: playback mode (usual and random order, that is shuffle - hence the name of the device), and well as the on/off switch and a battery indicator. The top houses only a 3.5 mm connector and an indicator. There are two of them to display information during playback and in docked mode. They work synchronously most of the time (sometimes, when you turn on your player, only the bottom LED lights up for several seconds). Even though there is no hold button, you can lock (or unlock) controls by pressing and holding the central button for three seconds. After that, any key presses will be ignored, the indicator will become yellow. It's very easy to reset iPod shuffle. In other iPods you had to press a certain combination of buttons to enable controls, but here you just turn the player off for five seconds. 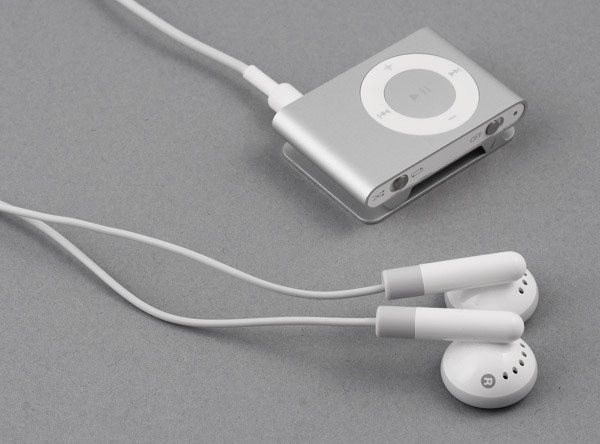 Like other iPods, this model automatically pauses playback, when you unplug the headphones. When re-plugged, you should press the play button to resume. We should describe the light indicator (to be more exact, two indicators) separately. Even though it seems useless, it can provide much information (it cannot compare with a display, of course). The bottom indicator lights green for several seconds, when you turn the player on/off. It means a good battery level (30 — 40%), orange — low (10 — 30%), red — very low (less than 10%). If the indicator does not light up, the player is discharged. If the indicator lights up green and then orange, you should restore the firmware. When the player is docked, the orange LED means charging, green — the player is charged, blinking orange — you cannot unplug the player right now - it's either syncing or is still mounted in the system (in disk use mode). The green light after you press any key during playback means playing, adjusting volume, changing a track, or "rewinding". Orange — locked controls, volume limit is reached. If the indicator blinks green and orange in turns, there are no records in the player. If the battery is almost discharged, the indicator starts blinking red. This player has evident drawbacks owing to the lack of a display: it does not show information about a current track, you have to select any track blindly moving forward or backward step-by-step, there is no detailed information about the battery level. To say nothing about additional features and games. The left column - an uncompressed file, the central column - the same file, but already compressed. The right column is published for comparison, it's the same file, but decoded by a computer. In fact, its content is an ideal - any mp3 player should aspire to it, if its designers want to provide high audio quality. In practice, a player cannot jump higher owing to an amplifier, etc, but it can get close to it. But not in this case. Narrow dynamic range, lots of distortions, and the most noticeable thing – weak channel separation. In practice, this behavior results in "compressed" sounding of frequency-rich music. You may also abandon hope to "guess" positions of instruments in space. However, you cannot even hope for it with the bundled headphones. But headphones are an accessory, they can be replaced; which makes no sense in this case. Whose fault is it? And what can we do about it? In fact, we have nothing to blame Apple for – the company never promised high audio quality in iPod players (unlike Creative, which advertises really excellent audio quality of Zen models as their main advantage over competitors). The company promotes stylish exterior, original design solutions, etc, but not audio quality. Sometimes we can see excellent results, like in case of iPod Video, sometimes results are reasonably mediocre, as in case of the first Shuffle, and sometimes we got what we see in the table above. We suspect that the company did not consider audio quality to be of primary importance, when it chose a true manufacturer. On the other hand, the problem may be not in electronics, but in the struggle for style and compact dimensions — enthusiasts are not crazy about the headphones jack, which is also responsible for other functions. So, bad channel separation results can be written off to the bad contact between the cable and the connector. Or may be not – we were not allowed to take the player apart to determine the reasons. We can actually establish the following fact: audio quality of the player is in harmony with the quality of bundled headphones. Considering that many users do well with the bundled model, it's no problem at all. True melomaniacs will hardly choose Shuffle owing to little memory and the lack of display. 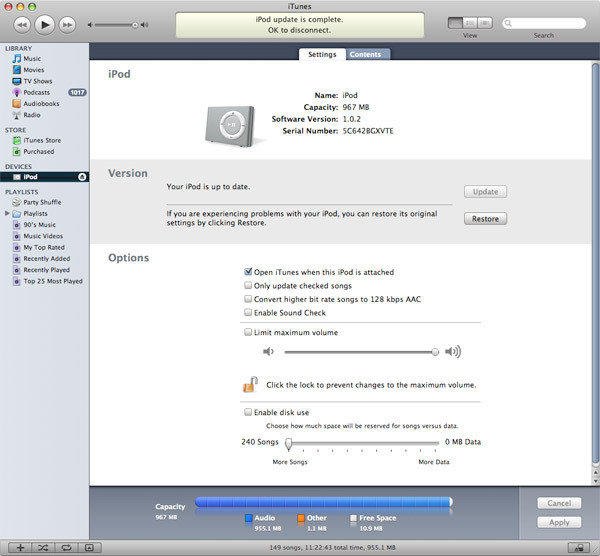 As in case of any iPod, you must use iTunes to copy music to your player. You can download and install firmware updates (Version 7 of the player), restore the player after a failure, configure synchronization options, automatic startup of the program when the player is connected to a computer, select the option to convert music automatically to 128 Kbit/with AAC (if the original bitrate is higher — it's important for those users who store their collections in high-quality formats, but who are ready to sacrifice quality to cram more music into their players), volume equation, you can specify maximum volume of the player, as well as to activate the disk use option (in this case the player won't be unmounted from an operating system after sync is complete, so that you can upload files to the player. But in this case you will have to unmount it in OS before unplugging it). There are several sync modes: random selection of tracks or sequential synchronization with a selected playlist or with the entire library. It takes about 4.5 minutes to fill the player completely. 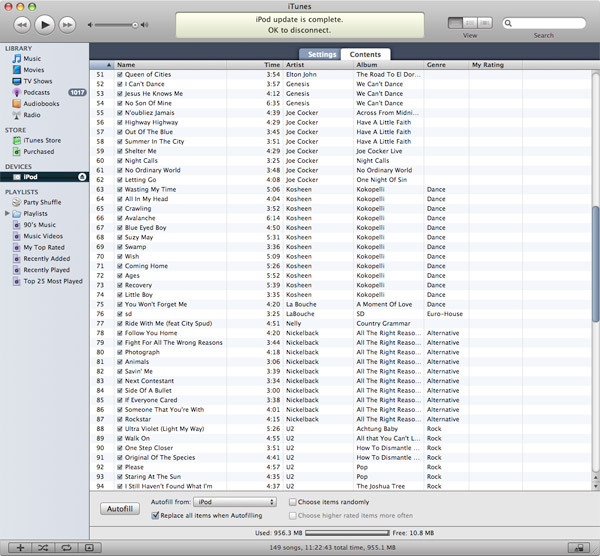 Later on, when you modify your playlist, the player will sync only these changes, of course. Low audio quality compared to other iPods as well as to models from other manufacturers. The official price for iPod shuffle in the USA is $79. In Russia you can get it for $100. The player produces a very nice impression, it's a worthy successor to the first model, and it will certainly be popular. It will be ignored by fastidious melomaniacs, of course: as a rule, they need lots of built-in memory, a display to show all necessary information about the current track, a library navigation system, high audio quality to be appreciated in expensive headphones. They are ready to reconcile with large dimensions and high prices in return). 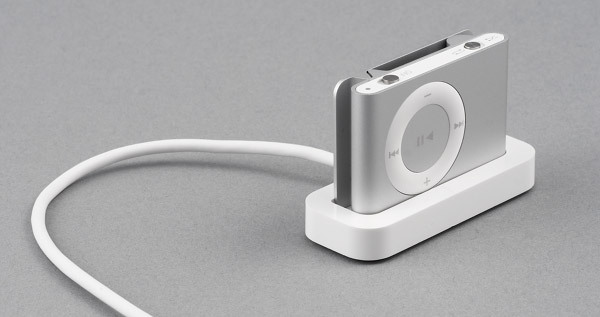 This Shuffle model is so plain and compact that you stop noticing it and just listen to music. That's exactly how the new product is positioned in the market. Here is the slogan: "Put some music on". That's what many users need.